Available on-line purchase without buying of truck. Expenses of abandonment of a trailer reduced to 1.200€. 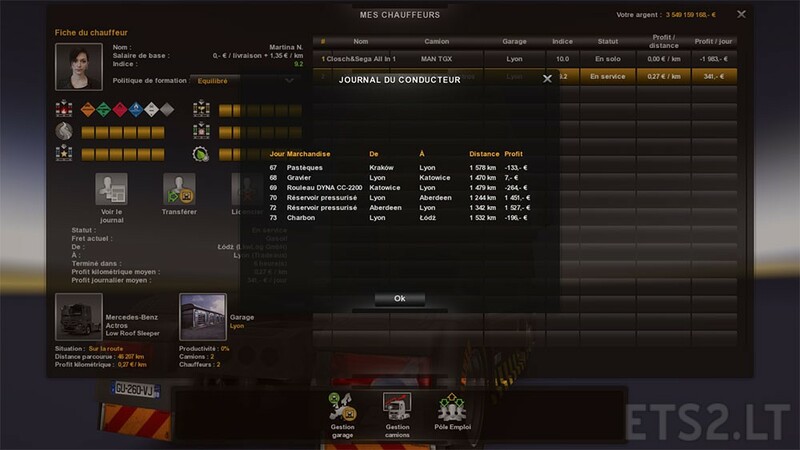 Expenses of the more realistic drivers. Modification completes of systems of the points of experience. Price of the fines fixed according to the French regulations. Price of the more realistic cargoes. Price of the reduced garages of 90 %. Price of the more realistic fuel. Reduction of the price in garages deleted. Occasions of trucks in 75 % of the initial price. More realistic exchange rate of currencies. Time of modified rest (45 minutes of break every 3:30 am). The past average speed of the drivers from 67 to 80 kph. 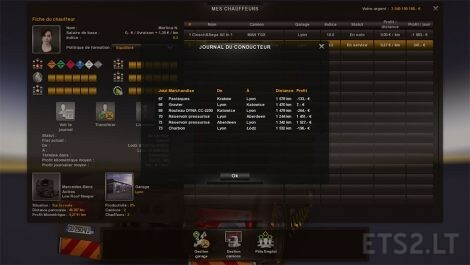 Hello, i think this mod have a very big problem; because for a 15h trip the game pay me like 2.400€!!! I’m shure there is a problem, if you can just fix it. Because if I fix it, all the drivers that you hire will be in deficit. ok, i will redownload your mod when you will find a solution.